Community leaders will be urged today to commit to strengthening the mental health and wellbeing of South Australians in order to build mental capital and grow the State’s mental wealth. At a Business Lunch organised by the South Australian Mental Health Commission, 230 guests, including business leaders, will hear that organisations that fail to create and actively sustain a mentally healthy workplace will not attract or retain good staff. Indeed, they may be operating an unsafe workplace! Governor Hieu Van Le; Minister for Mental Health and Substance Abuse, Leesa Vlahos and Chair of the National Mental Health Commission, Professor Allan Fels will address today’s South Australia: The State of Mental Wellbeing Business Lunch at Adelaide Oval. In South Australia, mental illness represents the largest share of all disease-related serious workers’ compensation claims – 19,000 out of 25,000 lost working weeks a year were due to mental illness. While 91% of Australians believe mental health in the workplace is important, only 52% believe their workplace is mentally healthy and 56% believe their leadership values good mental health in the workplace. Commissioner Burns said a workplace can only be as healthy as the culture its leaders create and nurture. “Mentally healthy workplaces are better for everyone and they’re more productive, so it makes good sense to invest in the mental health and wellbeing of the workforce,” he said. During the lunch, attendees will be reassured that there is assistance and advice available for employers to establish a mentally healthy workplace. 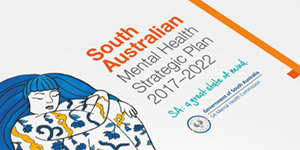 A key task for South Australia’s Mental Health Commission is to develop a mental health and wellbeing strategic plan for the State. Commissioner Burns is encouraging all South Australians to contribute to the new Mental Health Strategic Plan and help set the direction for the mental health and wellbeing of our communities and people. The Plan will look at how people can strengthen their mental health and wellbeing and access quality care and support when required. A series of Action Plans addressing priority areas will follow. Details on how to have a say are at samentalhealthcommission.com.au.